The local market would always have fascination for chicken dishes and specialty restaurants (or fast food chains). With the intense competition in this segment of the food industry, how can new entrants get in? I’m an entrepreneur looking into penetrating the restaurant industry by opening an establishment in Metro Manila that specializes on chicken dishes. However, I have yet to be 100% sure of this route before giving my team the go signal. With the city being saturated with new restaurants almost every month, how can I assure a favorable feedback from the market? Is this really a worthy investment? Chicken is entering a heightened phase and the world is turning more to chicken over other types beef, pork, and other types of meat. In fact, an international meat lobby recently called us in to create a business development and marketing campaign to grow its arm in the Philippines because the industry in general is embattled. Locally, the chicken war is entering into a fevered phase: from taste to texture, it’s heading towards the specialty route and mimicking the whole coffee retail experience that has been winning markets for years. Having been immersed in the food and beverage industry for more than 10 years now, I’ve observed that the same trend is flying for chicken retail today. Let me share with you a few points that would further explain this remark. The trend has shifted from taste to experience. The formerly leading chicken brands in the country are in the red (save for Mang Inasal) and even the newer specialty chicken dishes from C-stores are losing steam. While these were all the rage before, the time has come where convenience and taste have both given way to the boom of the customer journey and experience. Nostalgia restaurants are also beginning to decline. Today, the youth won’t flock restaurants in droves for dishes that scream “it was what lola used to make.” Unless brands tickle the market’s hip side, they are considered old. Designer chicken such as Size Matters, Taiwanese rock star Hot Star, Korean superstar Kyochon, and even diva Bonchon are not only distinctively delicious, but are also considered fashionable by consumers. Local is the new premium. I say this repeatedly because today’s local bets are poised to eat the “giants” of the industry. Legacy chicken restaurants are bowing out to local champions like Nadis Ihaw Ihaw in General Santos, Mano-Mano in Zamboanga, and Tatoy's in Iloilo. Chicken is clucking to a different tune. Sourcing and origin are also leading the discourse in terms of food quality, where people want to know more what their chicken has gone through. Questions such as “Is this a healthier option?”, “Is this antibiotic-free?”, or “Is this native?” have been growing point to consider over the years. Corporate social responsibility (CSR) is also becoming a leading discourse, where brands are expected to make an impact in the community they serve. Andok's breaks many rules but that'll be the story for another topic. If you intend to break in the chicken wars, do so but fight like a one-off and act like one. Drop the idea of copying. 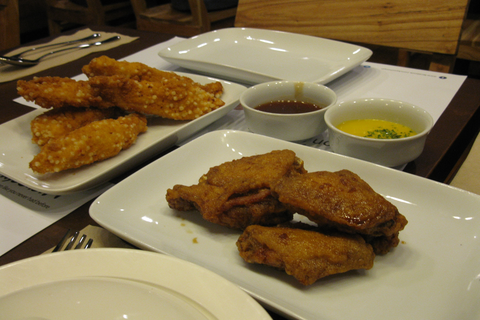 You won’t be able to sting like a bee by copying Aristocrat and Bonchon. When should you refresh your brand?